Other ingredients are gelatin, cellulose, stearic acid, magnesium stearate, and silicon dioxide. 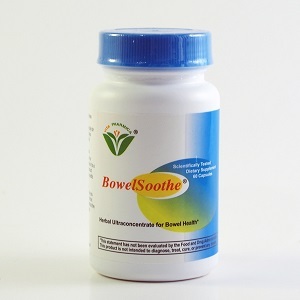 ▪ Helps to keep bowel motility normal. ▪ Maintains healthy bacteria in the intestines. ▪ Helps to maintain a healthy immune system. ▪ Keeps the intestinal cells nourished, healthy and functional. ▪ Helps to maintain healthy bowel regularity. ▪ Helps to maintain a healthy digestion. ▪ Helps to control occasional abdominal bloating, gas and water retention. None except sensitivity to any ingredient. A few BowelSoothe users, particularly those with constipation, may initially experience more gas and bloating than usual. Some may also experience other temporary symptoms such as light headedness, mild headache, restlessness, or inability to concentrate. Although these symptoms are mildly unpleasant, they only last a short time (usually 1-3 days) and signify that the BowelSoothe is starting to normalize the large intestine's movement. If you have any of these symptoms, continue taking the BowelSoothe as recommended, and drink as much purified water as you can to flush out the accumulated toxins that are causing these symptoms. For more information contact that manufacturer at 888-686-3683 or 949-588-8038 if outside the USA. Do not use if pregnant or provide it to a child without consulting a doctor. 4 capsules, 3 times daily, 15-20 minutes before meals.